Comments: While 4-LOM and Zuckuss are now quite well-known to fans, their proper names were initially a topic of considerable debate. When Kenner first produced the figures, the names somehow got reversed. But since these two bounty hunters were not identified in the film, the switch was not immediately noticed. 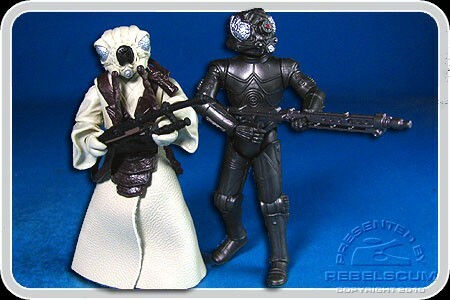 When the mix-up as finally caught and corrected in 1989, Zuckuss and 4-LOM finally got their rightful identities. In this exclusive set, we are paying homage to the first appearance of these bounty hunters that puzzled so many for years, with replica of the original packaging-switched names and all! "4-LOM" is a repaint of 2009's LC Zuckuss. "Zuckuss" is a repaint of 2007's TAC 4-LOM. This set was also available at Jedi-Con back in April, but with a Jedi-Con sticker. This version will be available at Celebration V, and includes the official logo sticker on the slipcase.